You can view a payment plan from the Ledger of the guarantor with whom the plan is associated or from the Ledger of any of the patients who have that guarantor in common. Note: For your reference, the Current balance (remaining principal), Remaining interest, and Remaining amount of the payment plan appear. Also, the amount of the Last payment (final payment) that will be paid appears. You cannot edit the details of the agreement, but you can edit the notes and/or type additional notes. 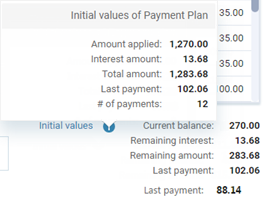 If you want to view the initial details of the agreement (for instance, after payments have been applied to any of the procedures associated with the payment plan, you want to see the principal amount of the agreement), click (or tap) the Initial values icon . When you are finished viewing the payment plan, click (or tap) Done.